schengenvisainfo.com is not affiliated with the European Union, the EU Council or any other government agency. 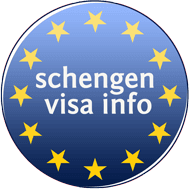 schengenvisainfo.com is a private publishing website that offers the Schengen Visa Information Guide Online. schengenvisainfo.com does not issue Schengen Visas. This website was created and it is hosted in servers located in Europe and US. Anybody with access to the world wide web can access our website www.schengenvisainfo.com. Access to the site “www.schengenvisainfo.com” is free of charge. Access and telecommunications network costs are the responsibility of the visitor to the site, as per the procedures determined by his access supplier and telecoms operator. The legal policy establishes the legal relationship between you as the user of our website and schengenvisainfo.com. The legal policy is not related to any legal advice or services. However, as individual situations may arise beyond what is included in our information guide, we do recommend that you contact the Embassy or Consulate of the country you intent to visit. schengenvisainfo.com does not issue the Schengen Visa and cannot offer any specific legal advice under any circumstances. In case you find any inaccurate information on our site we encourage you to write to us via email at [email protected] in order not to mislead the interested parties on the information we provide.